SCENIC 4 OR 8 MILE WALK IN SANTA MONICA! WHAT A WAY TO START YOUR DAY. Please register on this website. Your personal information will be stored securely and credit card information will be purged after billing. You can register your child (along with yourself) for the Children’s Walk To Africa. Day of Registration is available on site for last minute walkers for an additional $5. Be sure to wear comfortable shoes and clothing, along with sunglasses and a hat or other sun protection. Come early to register and get your t-shirt and goody bag. There will be live music, food and drinks. 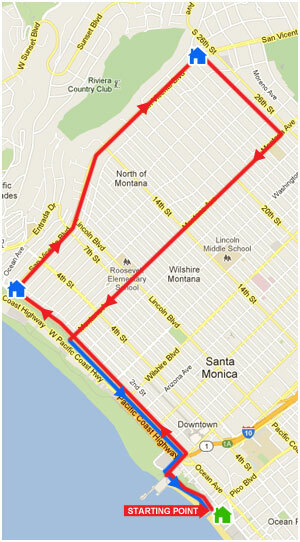 Pace yourself, this is not a race, but a walk along the bluffs and streets of beautiful Santa Monica. There are three (3) Africa Water Relief Stations along the route to rest and refresh yourself. See location for this information. If you do not expect to complete the course, which should take approximately three (3) hours, please plan your transportation accordingly. Take a look at our EXCITING sponsorship packages and show them to your boss or other business owners. There are opportunities for every budget, product or endorsement, and the sponsorship money from this event helps us to support short term medical relief missions. Parking directly adjacent to the Event is available at Beach Parking Lot #4, for a flat $12 all day rate. Entrance is on Bicknell Ave. and Barnard Way. Drop off on a round-about is on the north side of the park on Bay Street. Please do not bring bikes, scooters, or skateboards. Thank you!